Enter for your chance to win an invite-only tailgate for you and 19 friends to be held prior to your favorite team’s pro football game including catered food, games, gift bags and a meet and greet with a football legend. 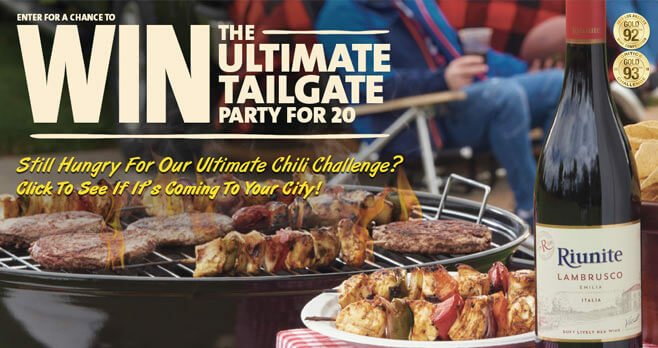 Eligibility: The Riunite Ultimate Tailgate Party Sweepstakes is open only to legal residents of the contiguous 48 United States, including the District of Columbia, who are 21 years of age or older at the time of entry.. Promotion Period: The Sweepstakes begins 12:00AM ET on August 1, 2018 and ends 11:59PM ET on October 31, 2018. Prize(s): The grand prize consists of 20 upper-level game tickets, catered food and beverages (non-alcoholic), team gift bags and an appearance by a retired local pro football player. The package will also include a $5,000 check made payable to the winner for projected taxes.